I am going to make a purchase here in Illumina (ILMN) utilizing a style preferred for bull markets ... but I guess at this point we can call this a bull market since corrections are hours at most. Plus the fact I sold a lot of long exposure earlier today... I want to have some other names to make up for it. Illumina is having a great day in a down tape... I don't see any news but it seems hot money has rotated into healthcare today after abandoning commodities. Maybe that changes in 2 days since hot money has no memory from day to day on what thesis it wants to buy. Technically Illumina has a breakout over $39... For a momentum trader this is what they chase... and since momentum is what works nowadays I'll give it a spin and see if it works. I'd rather do this purchase at 3:55 PM to make sure the close is over $39 rather than intraday but being cautious has been for geezers for 3 months now. So I'll increase the position size from 1.2% to 2.0% here in the $39.30s and them monitor it from there. Buying breakouts has been a losers gambit for most of the past year, but the past 2 months its been the way to go... I've been slow to adjust back to the old ways of doing things. 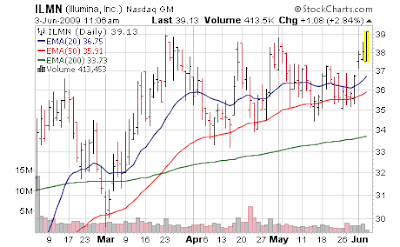 I don't see any news to drive Illumina, but it's been strong the past 2 days and I said if it broke $39 I'd play.